1Faculty of Medicine, Mahasarakham University, Maha Sarakham, THAILAND. 2Department of Biology, Faculty of Sciences, Mahasarakham University, Maha Sarakham, THAILAND. Context: Abutilon indicum and Mimosa pudica were a folklore recipe in Northeastern of Thailand. The recipe was reported that claim to diabetic treatment. Aims: The studies were evaluated to hypoglycemic effect, serum insulin secretion and blood biochemistry in streptozotocin (STZ)-induced diabetic rats. Materials and Methods: The recipe were composed of whole plants from A. indicum and M. Pudica (1:1 w/w) powder. The pound plants were macerated with aqueous (AMA), hydro-ethanol (AMHE) and 80% ethanol (AME) to crude extracts. The AMA, AMHE and AME at the doses of 125, 250 and 500 mg/kg body weight (b.w.) were administered orally daily in diabetic rats during eight weeks. Fasting blood glucose levels (FBG) were measured at weekly. The serum insulin levels and blood biochemical data including blood urea nitrogen (BUN), creatinine (CREA), total protein (TP), albumin (Alb), serum aspartate aminotransferase (AST), serum alanine aminotransferase (ALT), alkaline phosphatase (ALP), triglycerides (TG), total cholesterol (TC), high-density lipoprotein (HDL) and low-density lipoprotein (LDL) were estimated at the end of experiment. 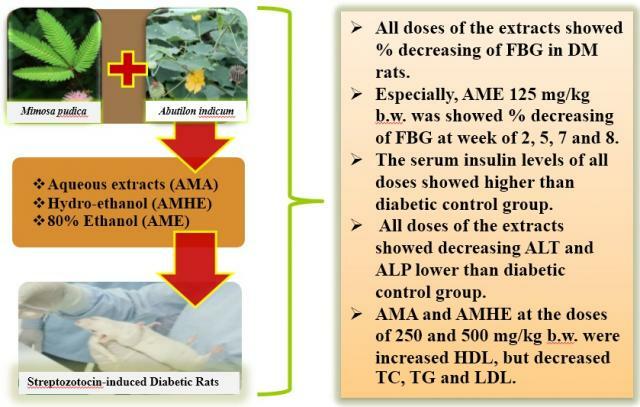 Results: All doses of the extracts were showed significantly (p<0.05) decreasing percent age of FBG in diabetic rats. Especially, AME 125 mg/ kg b.w. was showed more potent significantly (p<0.05) decreasing percentage of FBG at week of 2, 5, 7 and 8. The serum insulin levels of all doses administered with the extracts were significantly (p< 0.05) higher than diabetic control group. On the other hand, all doses of the extracts were significantly (p< 0.05) decreasing ALT and ALP lower than diabetic control group. While, AMA and AMHE at the doses of 250 and 500 mg/kg b.w. were increased HDL, but decreased TC, TG and LDL. Conclusion: The study was proved to diabetic treatment and improvement of diabetic stage and blood biochemical parameters. In addition, the experiment was confirmed to folklore traditional use. Konsue A, Talubmook C. Effect of Thai Folklore Recipe from Abutilon indicum and Mimosa pudica in Streptozotocin-Induced Diabetic Rats. Pharmacognosy Journal. 2018;10(3):480-485.